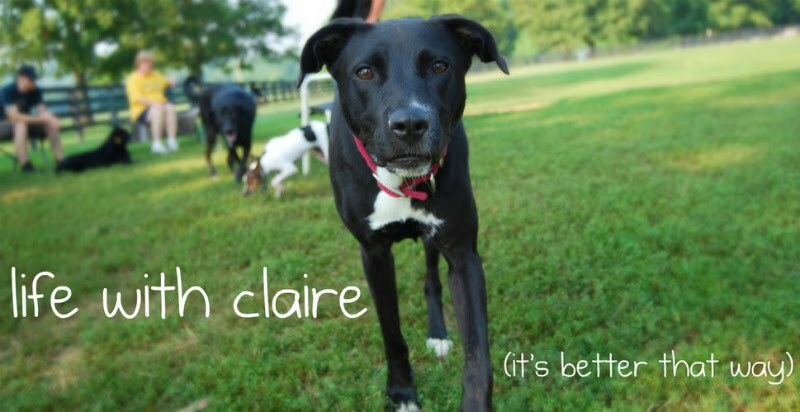 life with claire: the holistic dog. I started using doTerra essential oils about a month ago to help ease the symptoms of fibromyalgia and postural orthostatic tachycardia syndrome (POTS). Both illnesses can be hard to get under control, and sleep issues are not only a symptom but also a perpetuating cause of flares. Because of this, I first dipped my toes into the doTerra waters by purchasing lavender and a blend called Serenity. Before bed each night, I apply Serenity to the bottoms of my feet (the oils are more quickly absorbed into the bloodstream that way) and lavender to my neck and wrists. This stuff works, y'all. But that's a different story for a different time (email me if you are interested in hearing more). After a few nights, I noticed that, every time I opened the bottle of lavender, Claire's eyes would pop right open and her tail would start wagging. Every time. So, I began putting some lavender on her chest and behind her ears before putting her to bed. Since I started using it on her, I've noticed that she has a much easier time relaxing and falls asleep more quickly. I started doing some research, and it turns out that you can use a number of oils on dogs for so many different things. Claire had another bout of acute pancreatitis last week and I rubbed marjoram and lemon on her tummy and between her paw pads to help with the pain. Lemongrass and peppermint combined makes a great insect repellent, as does the Purify blend. The combination of lemon, peppermint, and lavender provide great allergy relief (and I'll be starting both of us on this regimen early next week). Clary Sage treats dry skin. Digest Zen treats nausea and vomiting. Frankincense and lavender/Serenity calm stressed out dogs. THE OPTIONS ARE ENDLESS!! I'm really excited about this discovery of doTerra, and it's worked so well for me and Claire that I'm now a Wellness Advocate for them -- after only a few weeks of being introduced to their products. If you have any questions about what essential oils might work for you and/or your dog, let me know and I'm happy to help! It's worth a try, right?